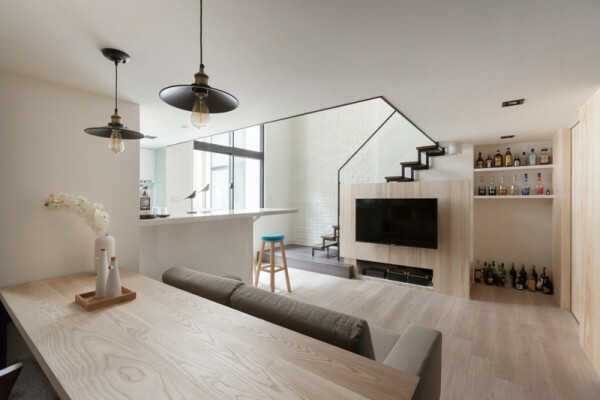 Loft apartments always have a distinct feel. 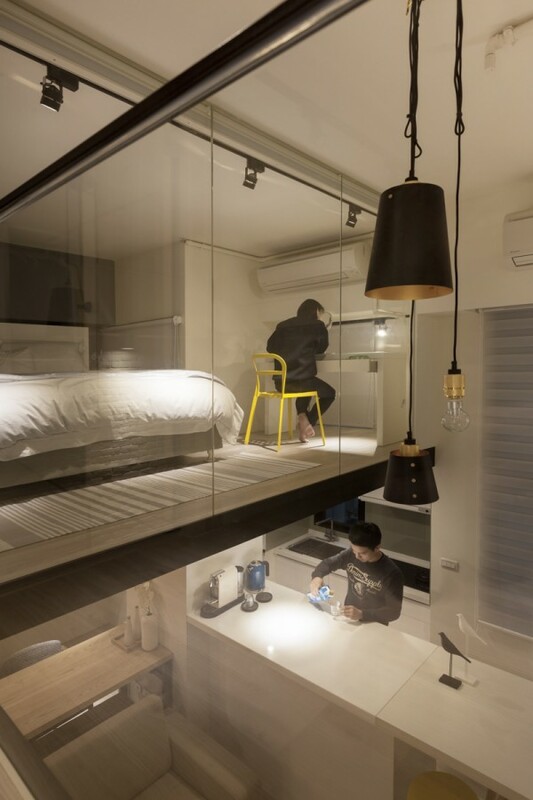 Their openness, combined with their usual amounts of streaming light, makes them instantly appealing for most urban dwellers. 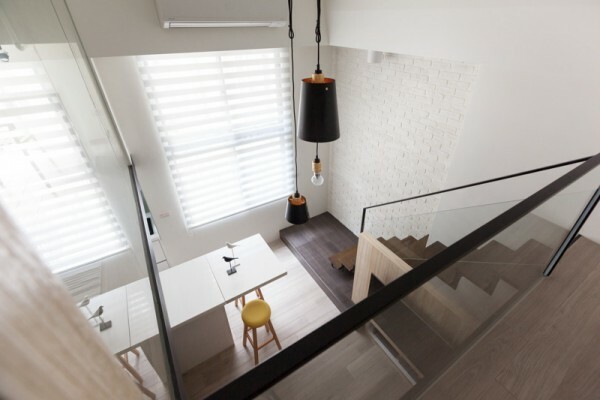 Who wouldn't want more light and a sense of more space in what's usually a more crowded area? 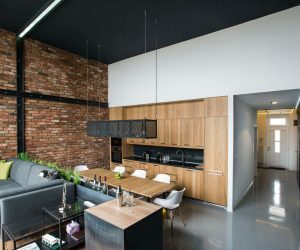 But lofts can also feel a bit cookie cutter, especially when the original space has been mass-converted to support loft living. 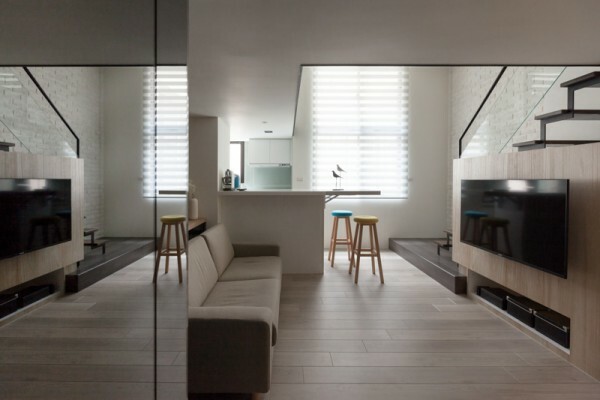 A dozen or more lofts with the same feel and layout can feel stifling. 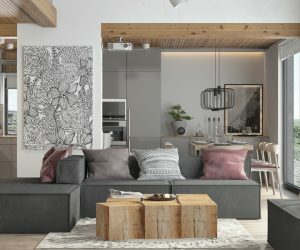 This loft, designed by Indot, takes the idea of a traditional loft and plays with it using geometry, color, and texture. 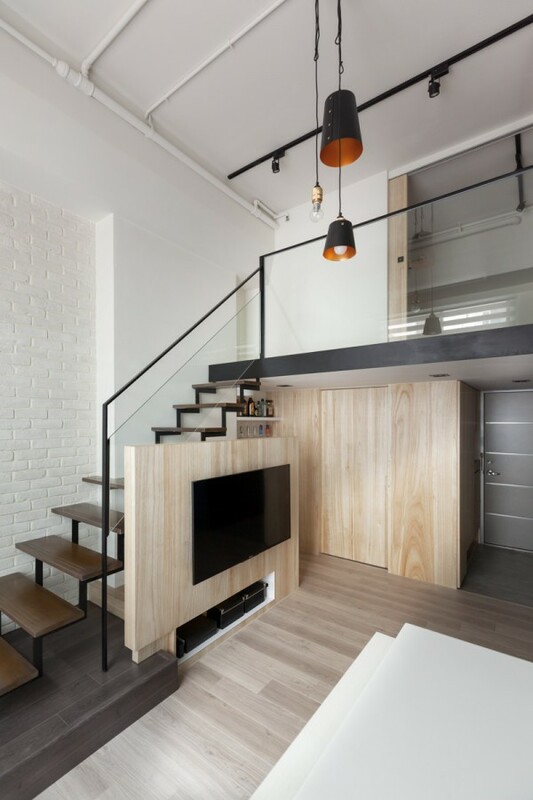 Don't think that lofts are just limited to red exposed brick and neutrally painted walls. 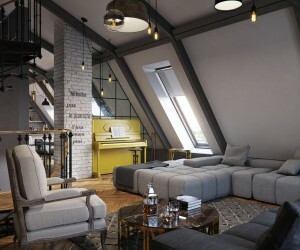 The main living area of this loft shows in just a few shots why this is more than your average apartment. Featuring light woods and whitewashed brick, this loft feels positively clean and airy. 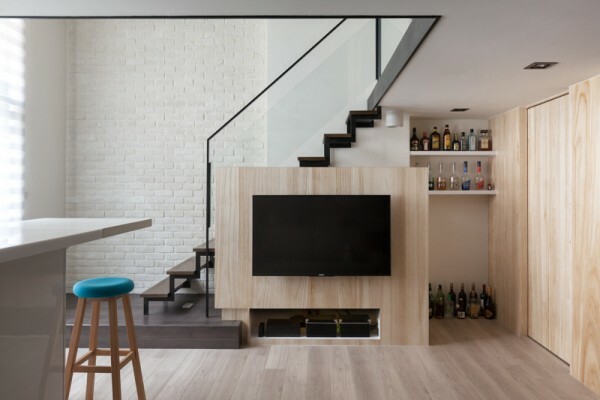 There’s thoughtful storage, a playful blue accent wall, and a striking black iron staircase leading up to the lofted area. 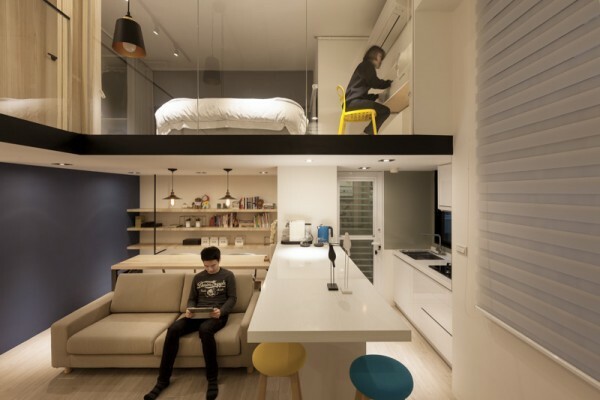 It’s very modern, with each furnishing carefully curated. 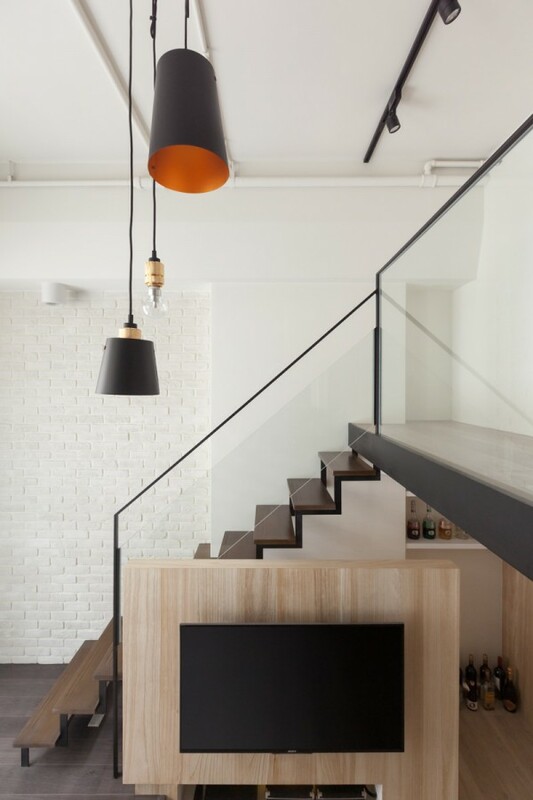 Industrially-inspired oil rubbed bronze fixtures lend light over the living and workspaces, connecting the same look found in the staircase. 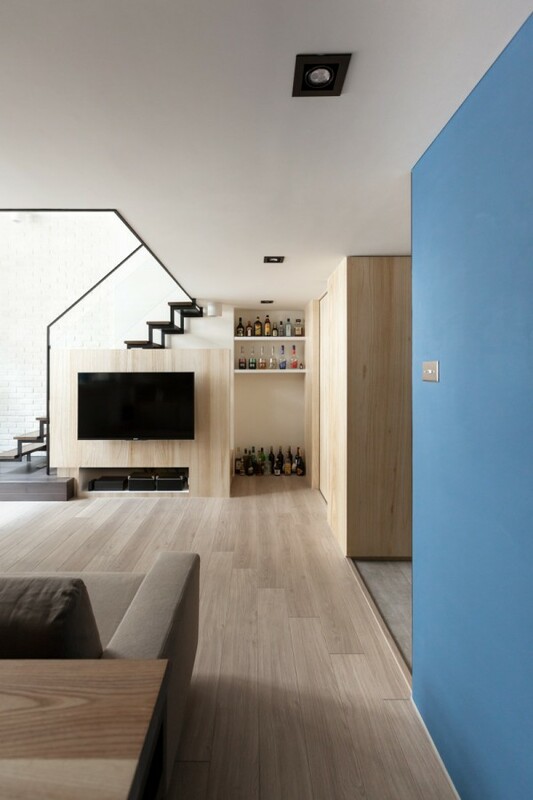 Blue, black, and neutral white woods complement each other throughout the main living space. The office area connects to the main area seamlessly, with a large open work area that’s ideal for everything from laptops to crafting projects. Behind the desk, open wall shelving that can be personalized to hold media, keepsakes, storage boxes, or anything else that might be needed. From another angle looking from the main living area to the kitchen, you’ll find an open bar and countertop of striking white. At the end, a simple bench with a playful pop of teal on the upholstery. 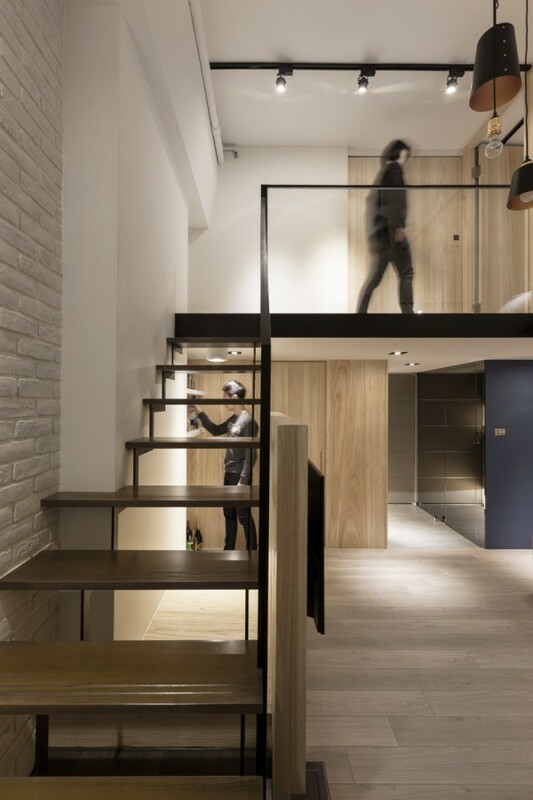 The steps leading up to the second floor loft are works of art in their own right. 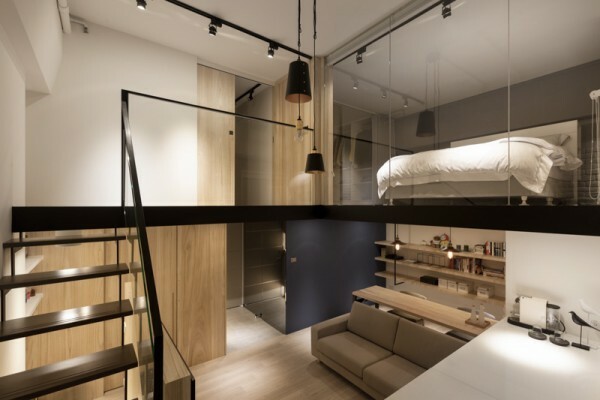 Wood and black metal cut through the white of the walls and are complemented by the glass sheets alongside the railings. A whimsical yet industrial collection of pendant lights soften the overall look. 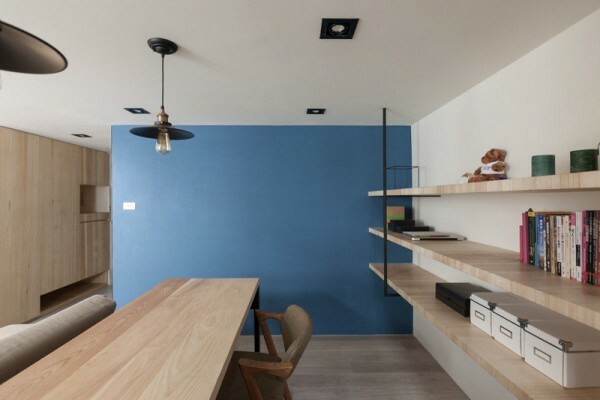 A closet blends seamlessly into the wall in the main living area. 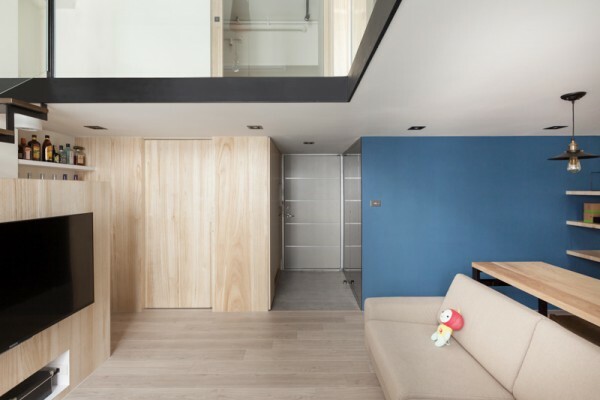 The foyer is simple and compact. 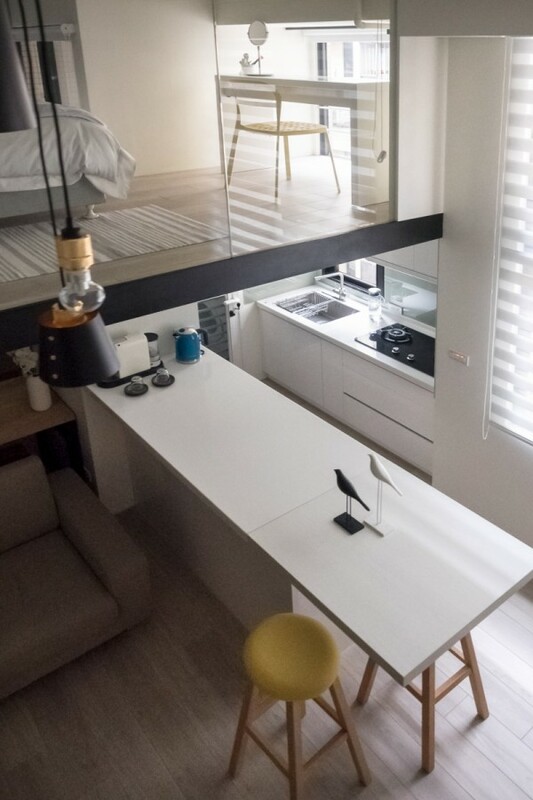 The lofted bedroom takes advantage of the natural light spilling in from the windows in the kitchen and main living area. The bedroom is soothing with tones of gray and tan. 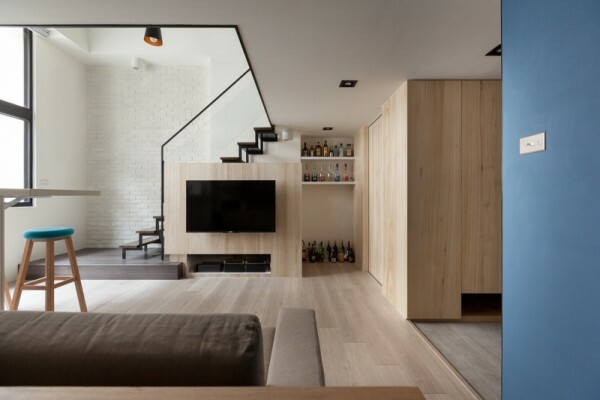 Soft textures of wood, wall, and linens make the space feel welcoming. Light spills in from the tall windows and floods the room. 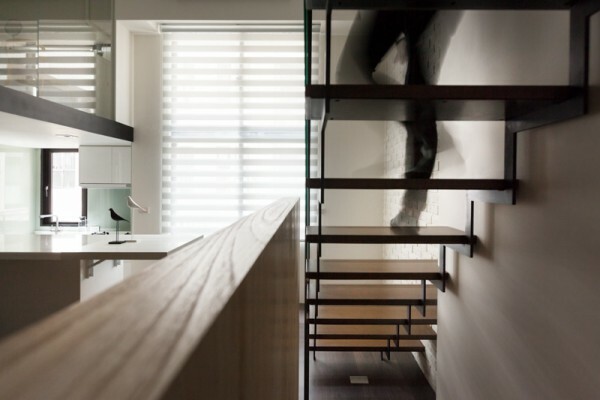 The spaces between the steps are especially clever, as it allows for the light to continue its travels. From the front door, this view shows the openness and brightness of the space. But it still feels cozy. 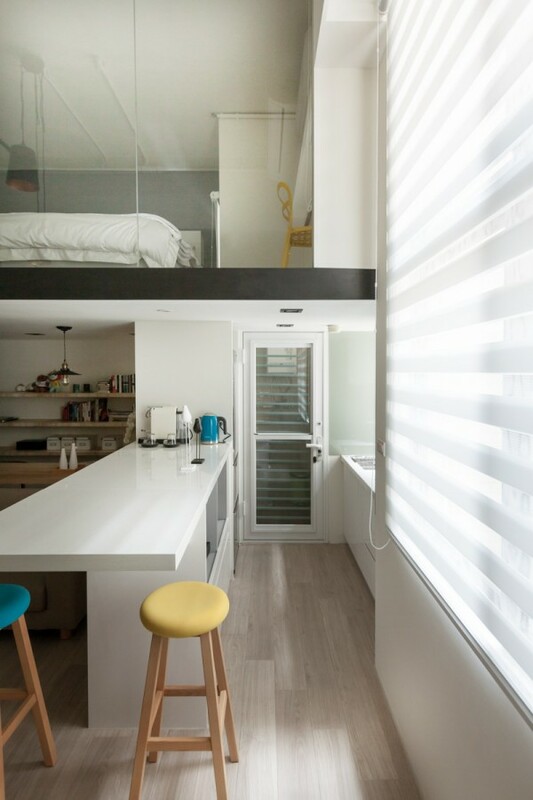 From above, you’ll see a cheery burst of yellow from the seat, as well as the clean white counters of the kitchen. Buffet dining that is simple, functional, and still very stylish. 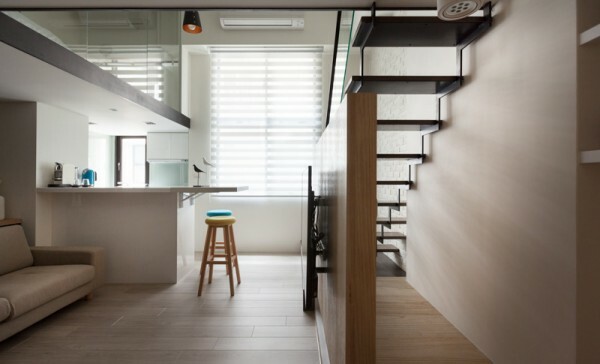 The galley kitchen, while simple, is efficient and well-designed. A vanity table placed at the corner of the sleeping area allows the light to flow in for makeup application at its best. 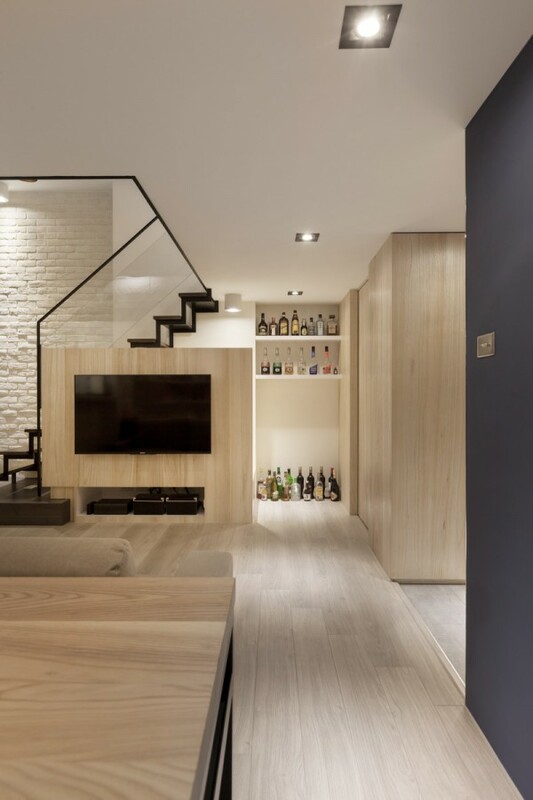 Behind the staircase, there’s additional open storage if needed. The media center showcases a smart design for a flat screen, as well as built in shelving for additional media and devices. Who wouldn’t love those pops of orange? And at the main level, you’ll see open storage which is being used as a bar. Once can easily imagine this couple entertaining. 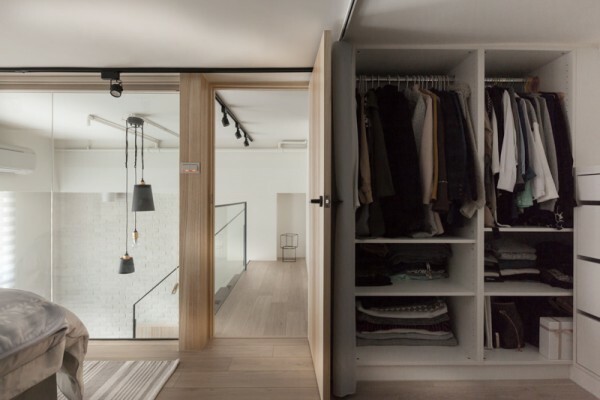 Open closet storage allows for plenty of space for belongings, but, should you choose, you can hide that dressing area. 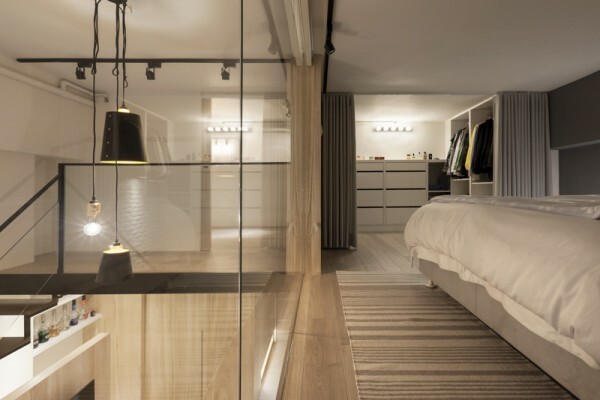 A simple curtain pulls over the closet, creating texture as a floor to ceiling “wall” while eliminating visual clutter. 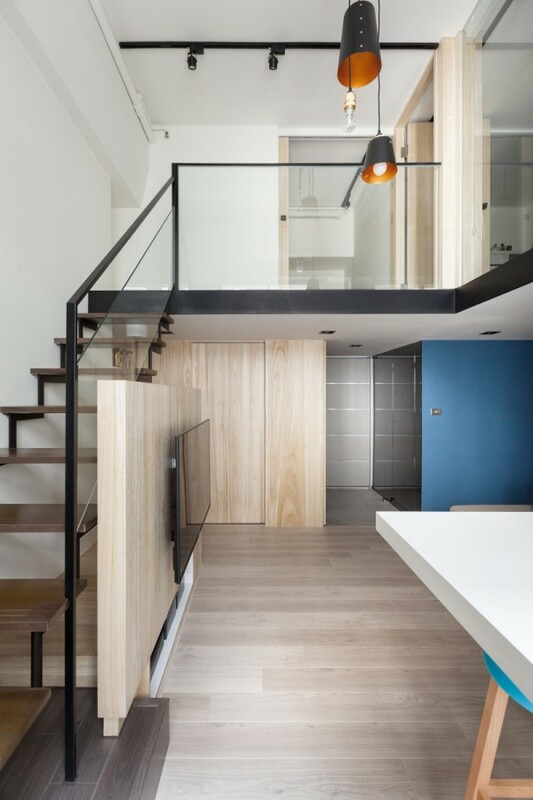 The color palette of light woods, white walls, and black fixtures carries through on both levels. 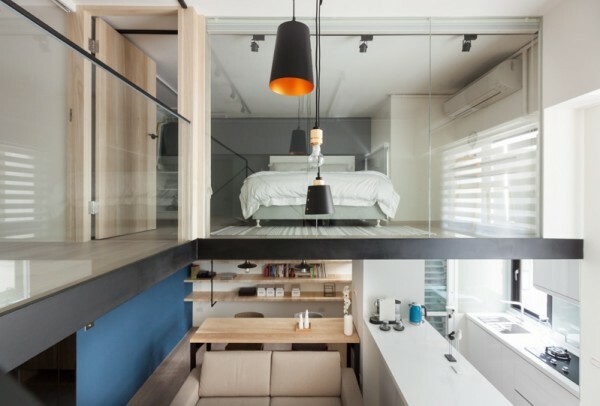 The loft takes advantage of glass to act as a divider, which ensures the light flows seamlessly throughout the space. The space is incredibly functional, even with a smaller footprint. 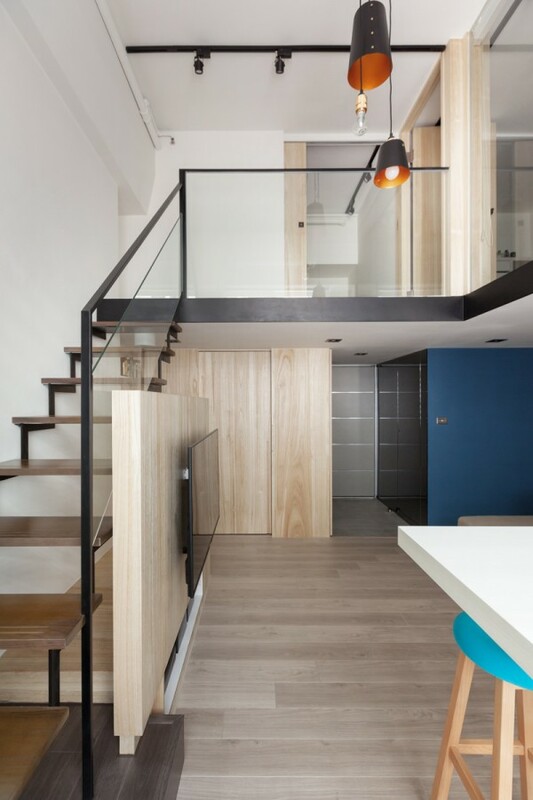 You’ll notice a long kitchen with modern cabinetry and appliances, as well as colorful seating at both levels to break up the room visually. 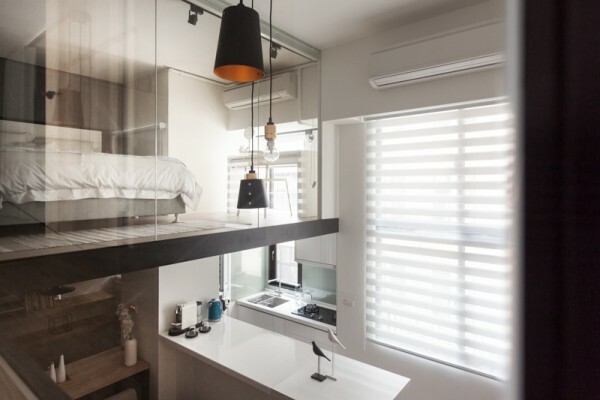 A ductless air conditioning unit is visible above the bedroom vanity and because of the open design, we’d imagine this loft stays pretty cool. 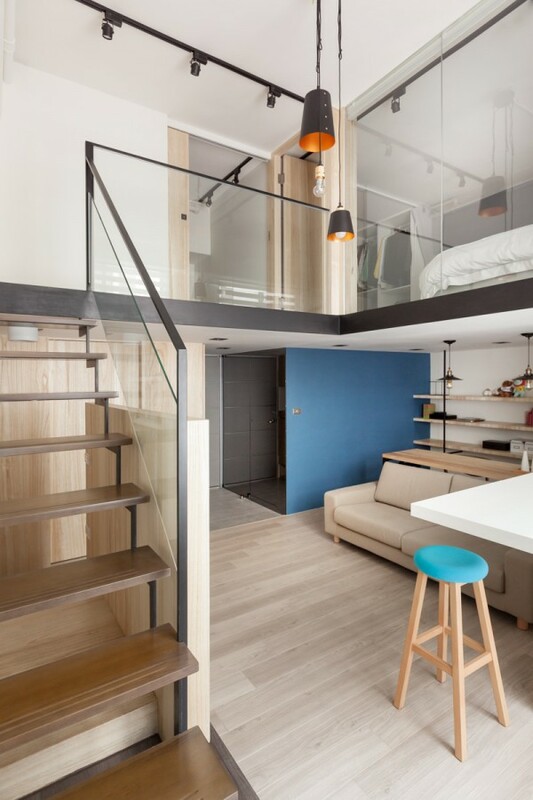 A great space for a couple, this loft allows both parties their space in complete comfort. 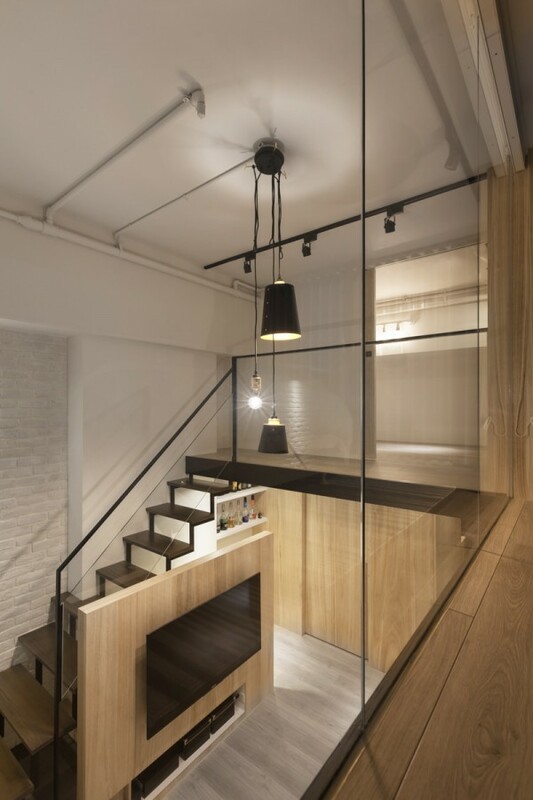 At night, a blend of industrial fixtures and recessed lighting work together to create a calming atmosphere. 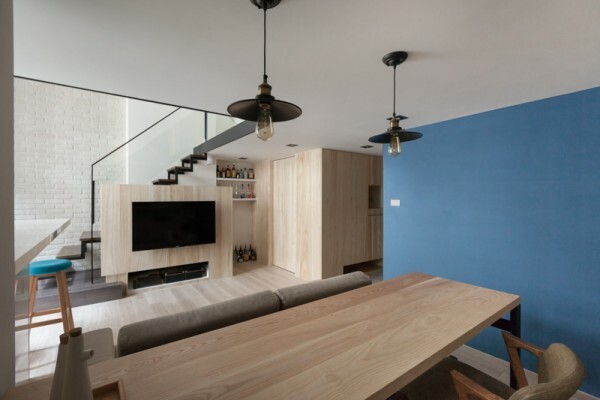 The blue of the wall in the downstairs area suddenly looks richer and more dynamic with the change in lighting. It’s almost as if the wall, like the sky, goes from day to night. It never feels too bright or too stark. Instead, it’s soothing. 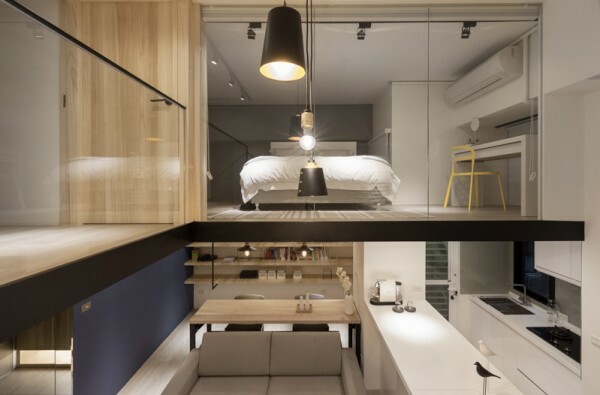 A beautiful loft that’s far from the conventional. That’s what this space is all about.